Lounging with a Latte: A delightful Bookazine! I have been following Carolyn from Aitken House & Gardens blog for a few years and was excited to see she has published her first 'Bookazine' that showcases many of her lovely photos from her blog. 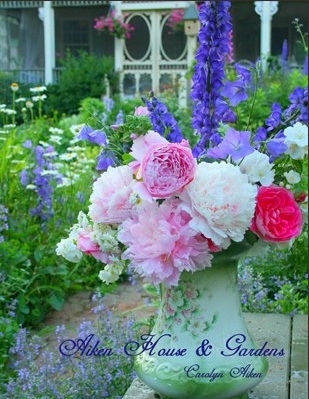 She is a passionate gardener and home maker, combine that with her photographic and writing skills and you have a blog that is always a delight to visit. I purchased her 'Bookazine' and have enjoyed and will continue to enjoy the images and snippets contained within. You can preview it and purchase it here if you're interested. Autumn has come and gone and our big Claret Ash has just about lost all its leaves. It makes a lovely show when it changes colour. The cooler weather always has me making good old hearty soups and casseroles. I put together a quick and easy Sausage Casserole last weekend. I was going to put a link to the recipe but the site I got it from is showing it's been attacked!! We are off for an overnight stay at one of my sisters today, to go through some of Mum and Dad's treasures that are left from when we cleared out their unit. All of us girls always contribute as far as food goes when we get together, so I made a batch of Cup Cakes yesterday. It's just a basic vanilla cup cake recipe which can be found here (I doubled it), but instead of 3 cups of SR Flour, I used 2 of flour and 1 of Almond Meal. One of our sons Daniel is a cabinet/furniture maker and in their new home he has made many pieces to give it a unique look. One of those things is a backing for their TV. He has recently added the shelves. He made a table with the same oak timber. Another sign that winter is here is when I pick up my knitting needles!! A friend inspired me yesterday with a couple of cowls she had made (thanks Jeanette! ), so I started one last night. Here is the pattern I'm following...very simple. I'm using 2 balls of wool at the same time and have chose 2 slightly different tones of a similar color. Can't really tell the pattern from my few rows yet, but I'll post another pic when it grows. That's it for now...enjoy your weekend! I hope you treasure that book. Carolyn's garden is amazing, she lives in a climate friendly garden. Hope you had a lovely weekend with family.I love the entertainment/bookshelf design, very clever indeed.